How to practise self-care when grieving the loss of a pet in a break-up. Most of us will have experienced the heartbreaking moment when we say goodbye to a beloved pet. 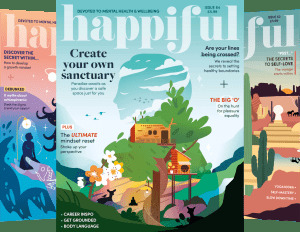 Pets play a huge part in our lifestyle, our family dynamics and our emotional state. And, when we lose one, under any circumstances, the loss can be felt for many years. Losing a pet in a breakup is particularly harrowing as you’re currently dealing with the grief of a relationship breakdown, and trying to come to terms with the loss of your pet, who hasn’t actually passed on. Written from my heart to yours (a heart that has a cat-shaped hole in it called Ernie) here are my top five tips for helping yourself through grief, when your ex-partner takes full custody of your shared pet. When it comes to the special connection we hold with our pets, it can be difficult to objectively consider their needs, but it’s the kindest thing you can do as their owners. In the case of most conventional pets, their basic needs are met with human interaction. Say you travel a lot for work and your ex-partner is generally at home (and can provide for your pet in a loving and safe environment), giving them custody is the most responsible action you can make and takes great courage. Cutting ties vs ‘joint custody’. This comes down to practicalities. It’s common and completely normal that you’ll be experiencing feelings of emotional turmoil when your relationship has come to an end. Try to consider the emotional strain you may feel if you’re ‘allowed’ to visit your pet once a month or once a year. Will your ex-partner be there and how will you feel? How will you feel when you have to say goodbye again? What will your pet feel? To protect your emotional well-being and practise self-care, perhaps cutting ties will be kinder to your healing process, no matter how traumatic at the time. Recognise it is a loss. Regardless of whether your pet has passed on or not, the loss of its physical presence, of its love and affection in your life is a loss and can be felt with great depth. 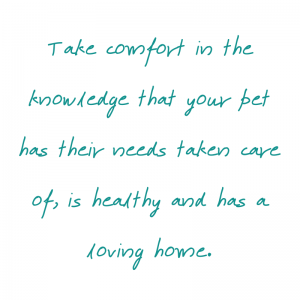 Be comforted in the knowledge that your pet has all their needs taken care of, is healthy and has a loving home. Create a bank of memories. In the early stages of a breakup, it can be too painful to look at pictures or videos you’ve taken in happier times with your pet, but you don’t want to lose those memories. Put them in a box or album that’s specifically reserved for times in the future when you need a sneak peek. Be proud of yourself. You did what was morally right. You gave your pet a wonderful life and continue to care from afar as they move forward with your ex-partner. Be proud of the love that you gave an animal and the experiences you shared. Finally, know that you aren’t alone. If you’re dealing with any kind of pet loss or bereavement and would like to speak to someone, search for a qualified therapist specialising in pets.